Dubai, UAE, March 13, 2019: Parmigiani Fleurier presents a new stone-set Tonda 1950 range, one which offers extraordinary brilliance. 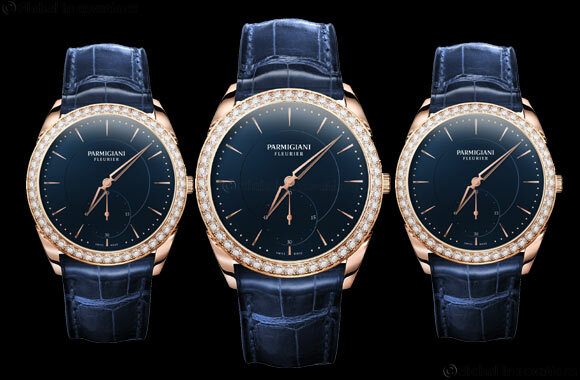 The round diamonds of the Tonda 1950 Stone-set and the precious stones of the Tonda 1950 Rainbow illuminate Parmigiani Fleurier's revamped ultra-thin women's watch. The rose gold case on the new model is complemented by one of three dials. The Tonda 1950 set with diamonds features a dial in Abyss blue – one of the brand's signature colours – a pinkish pearl colour, or a white mother-of-pearl with a rich, reflective texture. The Tonda 1950 Rainbow is exclusively available with a white mother-of-pearl dial. The logo, understated and slightly larger, stands out at 12 o'clock whilst remaining in keeping with the delicate dial design. The delta-shaped hands are skeletonised with a gilded outline which echoes the rose gold-plated indices. The Tonda 1950 boasts the quintessential Parmigiani Fleurier aesthetic. The iconic profile with 4 round lugs making it an ergonomic piece to wear; the quest for a harmony between the proportions of each element of the dial and case; the delta-shaped hands and cut crown – all signs of the elegance inherent to the brand's DNA. Remarkably, the Tonda 1950 Stone-set and Rainbow remain ultra-thin models, despite their richly stone-set bezels. These slender proportions are made possible by the PF701 calibre which measure just 2.6 mm thick.